Last Sunday at Queen Anne Christian Church, Christian Church (Disciples of Christ), we celebrated All Saints Day by remembering all those who have gone before us to their reward. Now in the Disciples church All Saints day is not usually a day we celebrate. It’s not that we don’t remember those who have gone ahead of us but we Disciples often pick other days to remember them, such as Memorial Day, Thanksgiving Sunday, Veterans Day, or a day that holds meaning for a particular congregation. Queen Anne does this on the Sunday following November 1st and this year that day was Sunday November 4th. I of course had to put my father at the base of the tree because he was my first real spiritual teacher, but, along with him there is the minister that first allowed me to really question my theology and not give me answers. There are the surgeons who treated me and saved my life when I was 6 when I was severely burnt, nor can I forget my first grade teacher Miss. Wooster, who was handicapped and warmly welcomed into her class this little girl who was swathed in bandages. These saints were the first to model the act of being compassionate and merciful; they wouldn’t be the last. On my tree are the names of my elderly neighbors who taught me the joy of just being alive. Winnie and Joe took life as it came, the good and the bad, and made the most of the time they had on earth. They were a generous couple who shared their lives with me, my husband and any dog that walked into their lives. In fact I don’t believe either of them ever met a dog they didn’t like. Winnie’s motto was “dogs rule” and in her house they did. I added authors I’ve never met but have read and learned so much from. At the roots of my tree there are the Founders of my tradition Alexander Campbell and Barton Stone whose theology of ecumenism has rung through my life like a bell and is the corner stone of my faith. There theology was passed down to me through my Great-great grandparents, Great Uncle, grandparents, and parents and now my time has come to pass it on, like a torch. Farther up the tree are authors, teachers, friends and people I can no longer name but remember their teachings. There are political leaders too such as John F. Kennedy whose life and death left a great impression on me and next to him is President Obama who tries to be as forthright as he can in very difficult situations and I recognize his courage can also be a model for me. There are so many more it is impossible to name them all and the tree just isn’t big enough. The author of Hebrews tells us we are surrounded by a cloud of witnesses and that we need to remember to be gracious and liberal with our hospitality because we never know when the stranger will be one of our saints who teach us something new. But I think there is something we often don’t think about and that is the influence we have on others. What if by our hospitality we have changed the stranger and we become the saint. Have you ever thought you could be a witness to the love of G-d? Modesty, shyness or social convention often keeps us from thinking we might be a “saint” for someone else. In fact we are often taught to take little notice of how we help others because we aren’t supposed to take credit or be proud of what we do. Remember the old chestnut “pride goeth before the fall?” Pride was one of the 7 deadly sins and was to be controlled at all cost. But Jesus never taught that, in fact he wanted people to be models of his “new way” of living and you can’t do that if you hide. Jesus says don’t put your light under a bushel rather place it on a hill for all to see. The fact of the matter is, it takes hard work and practice to be hospitable to unpleasant people in difficult situations but it is that kindness and mercy that starts the change in the other and it began with you. All of the people on my tree didn’t think they were saints or witnesses, but they were. They modeled a way of life I wanted to emulate. They may not have ever heard of Hebrews or Micah but they lived their lives as if they did and that’s what is important. I meet people every day, sales clerks, teachers and fellow students, the homeless and how I treat them is a reflection of what I learned from my cloud of witnesses. I learned a smile and a thank you to store clerk can make their day; that offering my lunch to someone who is hungry on the street will fill a hungry place within. My witnesses and saints have taught me to be generous, kind, and merciful; giving me a way to walk with G-d that is serving me well and hopefully a good witness for someone else. Who are your witnesses and saints? 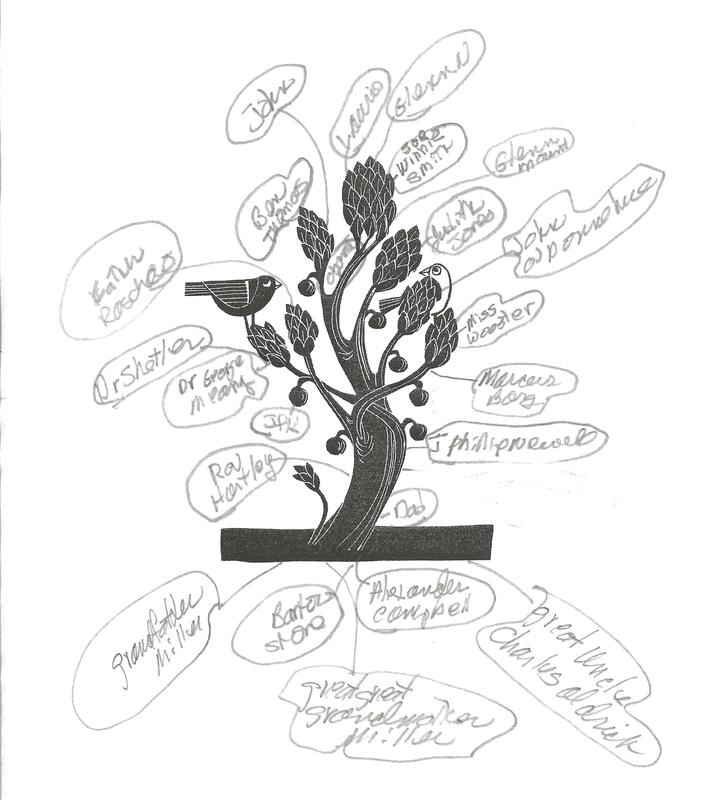 Can you fill out your own tree with people past and present who have made a difference in your life? Can you make another tree where your presence has made a difference in someone else’s life? Think about and let me know. NOTE: I don’t know where the links in the posting come from. I didn’t ask for them and I am trying to figure out how to get rid of them. I just wanted you to know I didn’t authorize them in any way.